To secure your computer you install antivirus, firewall or internet security suite. Apart from that you can increase the level of protection on your computer by using OpenDNS. It is a free DNS service provider. If you connect to internet then it is a must that you use a DNS server. At the very basic level you get malware/botnet and phishing protection. When certain Internet-scale botnets are discovered or particularly malicious malware hits, it offer protection to all our users so that as many people as possible can be protected from the threat. At this time, this feature blocks the Conficker virus and the Internet Explorer Zero Day Exploit, and is continually expanded to include other types of malicious sites. Phishing protection, you’ll protect everyone on your network from known phishing sites using the best data available. Phishing sties are fake sites that it they not what they say they are. These phishing sites can fool you into giving your important personal information like your identity, address and in extreme case your bank account or credit card information. So protect yourself from these online threats using OpenDNS. For instructions to change DNS server click on link provided below for your operating system. In addition you can register a free account in https://store.opendns.com/get/home-free. This provides you with web filtering or parental filtering feature. It provides blocking of websites from various categories. 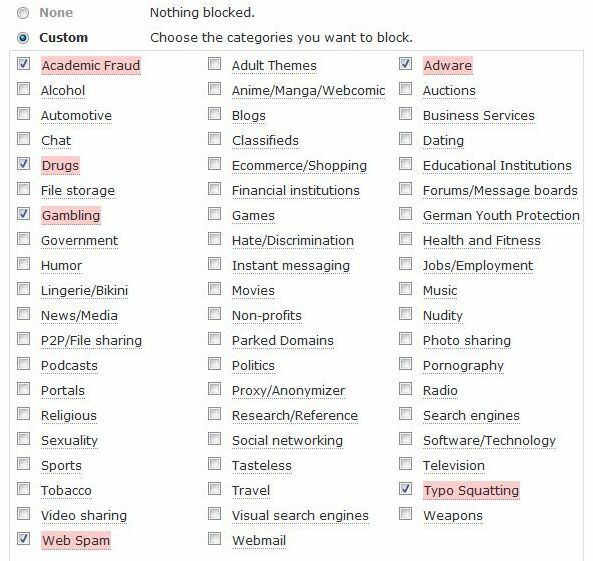 As shown below I have chosen to block websites in categories Academic fraud, drugs, gambling, web spam, adware and typo squatting. This can be done in settings when you login in your account with OpenDNS. If you want to know more about cyber security and home computer security then follow the links below. The DNS settings on a computer running the Microsoft Windows operating system (OS) are configured in the TCP/IP properties window for the computer. The following example to change DNS server settings is based on the steps required to change the settings on Microsoft Windows 7 OS. They may differ slightly based on the specific version of Windows installed on the computer. Step 1– Select the “Start” menu button and click the “Control Panel” icon. Step 2 – Select the “Network and Internet,” “Network and Sharing Center,” and “Change Adapter” menu options. Step 3 – Choose the network connection to configure to use the public DNS server. For an Ethernet connection you would right click the “Local Area Connection” menu button and then choose the “Properties” menu option. For a wireless connection, right click the “Wireless Network Connection” and choose the “Properties” menu choice. Then, enter a password if prompted or confirm that you want to modify the setting. Step 4 – Choose the “Networking” menu tab. Then select the “Internet Protocol Version 4 (TCP/IPv4) or Internet Protocol Version 6 (TCP/IPv6) menu option followed by clicking the “Properties” menu button. Step 5 – Select the “Advanced’ menu option and then click the “DNS” menu tab. Note any DNS server IP addresses listed on this screen for future reference and clear from the window. Click the “Ok” menu button. Step 7 – Restart the network connection selected earlier for configuration. Then, repeat the steps for any additional network connections that require reconfiguration. On your Start menu, open the Control Panel. In the Control Panel window, click Network Connections and choose your current connection. On the General tab of the Connection Status window, click Properties. On the General tab of the Connection Properties window, scroll down and select Internet Protocol (TCP/IP), then click Properties. On the General tab of the Internet Protocol (TCP/IP) Properties window, in the lower section, select Use the following DNS server addresses, and then type the public DNS IP addresses shown in the yellow box on this page. 3. Right click on your connection from the Network Connections window and click Properties. 5. Click the radio button Use the following DNS server addresses and type in Comodo Secure DNS addresses in the Preferred DNS server and Alternate DNS server fields. Please write down your current DNS settings before switching to Comodo Secure DNS, in case you want to return to your old settings for any reason. In the Control Panel window, click Network and Sharing Center. In the Network section, select View Status of each connection. On the General tab of the Connection Properties, scroll down and select Internet Protocol Version 4 (TCP/IPv4), then click Properties. On the General tab of the Internet Protocol Version 4 (TCP/IPv4) Properties window, in the lower section, select Use the following DNS server addresses, and then type the DNS server IP addresses shown in the yellow box on this page. On the General tab of the Connection Properties window, scroll down and select Internet Protocol Version 4 (TCP/IPv4), then click Properties. 2. Click on View network status and tasks. 3. Click on View Status. 4. Click the Properties button. 5. Vista may ask for your permission to make changes. If so, click the Continue button. 6. Select Internet Protocol Version 4 (TCP/IPv4), then click the Properties button. 7. Click the radio button Use the following DNS server addresses and type in 8.26.56.26 in the Preferred DNS server and 8.20.247.20 in the Alternate DNS server fields. On Mac OS X the DNS server settings and set and changed in the “Network” window of the operating system. This example uses the specific instructions required for Mac OS X 10.5 and may slightly vary based on the specific version of the OS installed on your computer. Step 1 – Select “System Preferences” followed by the “Network” menu options from the “Apple” menu. Step 2 – If there is a lock icon located in the lower corner of the window preventing step 1 from being completed, then click the icon and enter the administrator password for the computer. Step 5 – Choose the “Apply” and “Ok” menu buttons to finish configuring the DNS server setup for your Mac computer. Repeat the instructions for an additional network connection on the same computer. 2. Click Network from the Internet & Network row. 3. Click Configure… button at the bottom of the screen. 4. Type in Comodo Secure DNS addresses in the DNS Servers field, then click Apply Now. In the majority of Linux distributions, the DNS settings are configured or set by using the Network Manager. This example uses settings required on Ubuntu and the steps may be different based on the Linux build or version that you have installed on your computer. Step 1 – From the computer’s “System” menu, choose the “Preferences” and “Network Connections” menu options. Step 2 – Choose the network connection that you want to change to use a public DNS server. For an Ethernet connection, you would select the “Wired” menu tab and then choose the network interface from the resulting list which is normally called “eth0” For a wireless connection, choose the “Wireless” menu tab and select the appropriate wireless network. Step 3 – Choose the “Edit” menu button and then choose the “IPv4” or “IPv6” settings menu tab. If you see that the current method being used is “Automatic (DHCP),” then open the dropdown and choose the “Automatic (DHCP) addresses only” menu option. If set to another option, do not change the selection. Step 5 – Choose the “Apply” menu button to save the changes. Some builds of Linux will then as you to enter a password to confirm the changes. Repeat the same procedure for any additional connections that you want to change. On a mobile device, the DNS server configuration will normally be saved under the advanced wireless or WiFi settings. The following procedure is generic in nature and will likely require slightly different steps based on the brand of the device being changed. Step 1 – Open the WiFi settings screen or menu. Locate the menu option or screen where DNS settings are listed. Step 2 – Note any IP addresses listed for the primary and secondary DNS servers in the event you need to change the settings in the future to the original ones. Step 4 – Choose the “Save” and “Exit” menu options to complete changing the DNS server settings on your mobile device. How Do You Test Public DNS Server Changes? Step 1 – Launch the web browser on the computer or mobile device that has public DNS servers entered. Step 2– Enter a well-known website such as www.tech-faq.com or www.google.com. Step 3 – If the page loads properly, bookmark it in your browser. Step 4 – Access the page from the bookmark. If the well-known site loads from each test, then the changes to the public DNS server have worked appropriately. Step 5 – If the webpage fails to load from either test enter a fixed IP address. A well-known one that can be used is: http://18.62.0.96/ which should resolve to MIT. If this works, bookmark the page and try again. If the IP address entry fails, you likely entered the DNS changes incorrectly and need to try again. Step 6 – If neither of the IP address tests works, then enter the old DNS servers and run the tests again. If they fail, then there is a problem with the computer’s network connection that may require ISP or network administrator assistance. If the computer works normally after reverting to the old DNS settings, then there is likely an issue with the public DNS server that you have tried to use. How Do You Troubleshoot DNS Server Errors? In the event you are encountering errors or issues after changing to a public DNS server there are some troubleshooting steps that you can take to verify if the error is with the DNS server. Once you run each of the commands, save the results in a text document so that you can send them to the appropriate help desk or message board that supports the server (if there is one). Step 1 – Confirm that your computer can establish communications with the public DNS server. On a Windows computer, open the DOS command prompt by selecting the “Start” menu button and entering “CMD” in the search text field. Step 2 – enter “tracert –d serveraddress” followed by pressing the enter key. ON a MAC OS X computer, open the terminal and enter “/usr/sbin/traceroute –n –w 2 –q 2 –m 30 serveraddress . On Linux, sudo traceroute –n –w 2 –q 2 –m 30 serveraddress. If you do not see the DNS server IP address as the final hop on the return trace or there are a lot of timeouts, then there may be a network connectivity issue preventing contact with the public DNS server. If you see a section with an A record listed for the hostname on the output, then the DNS server can resolved the name and you should confirm the DNS settings on your computer again. If you do not see an answer for the hostname, then proceed to the next step. Step 4 – Confirm that another public DNS server can resolve the hostname that you have selected. Enter the following commands at the command prompt on Windows. There servers used are from Level 3 and Open DNS (Last 2). If you get a successful result, then there is likely an issue with the first public DNS servers that you tested. If you do not get a successful result, then there is probably an issue with the servers being tested and should be tried again after waiting for a bit. Step 5 – Change your computer’s DNS settings to the original servers that were being used if you have no success in changing the settings to a public DNS server. Based on your operating system, you may need to manually enter these addresses again and restart the computer or device. If you are encountering problems when resolving particular names, and want to verify whether the problem is with Google Public DNS, please try running the following diagnostic procedures. If the last line of the output does not list 8.8.8.8 as the final hop, or if there are significant timeouts, there may be a network problem preventing you from contacting our servers. Please include the output of the command in any communication with the Google Public DNS team. If the last line of the output does list 8.8.8.8 as the final hop, continue to step 2. If the last line of the output does not list 2001:4860:4860::8888 as the final hop, or if there are significant timeouts, there may be a network problem preventing you from contacting our servers. Try configuring Google Public DNS for IPv4 to diagnose whether the problem is due to IPv6 connectivity on your network. If IPv4 works for you, you may want to revert your IPv6 configuration and use Google Public DNS with IPv4 exclusively. Otherwise, please include the output of the command in any communication with the Google Public DNS team. If the last line of the output does list 2001:4860:4860::8888 as the final hop, continue to step 2. If the output shows an answer section with an A record for the hostname, then Google Public DNS is able to resolve the name. Check your settings to make sure your system is correctly configured to use Google Public DNS. If you are still unable to solve the problem, please include the output of the command in any communication with the Google Public DNS team. If the output does not show an answer for the hostname, continue to step 3. If the output shows an answer section with an AAAA record for the hostname, then Google Public DNS is able to resolve the name. Check your settings to make sure your system is correctly configured to use Google Public DNS. If you are still unable to solve the problem, please include the output of the command in any communication with the Google Public DNS team. If the output shows an answer section with an A (IPv4) record for the hostname, then Google Public DNS is able to resolve the name, but the host and/or its nameserver are not configured to return IPv6 results. If you want to verify that you are correctly receiving AAAA records, you can use the hostname ipv6.google.com as a generic test. If the output for ipv6.google.com, or another host for which you are certain IPv6 records exist, does not show an answer, continue to step 3. If the output does not show an AAAA record for the hostname, this may be because the the host and/or its nameserver are not configured to return IPv6 results. If you want to verify that you are correctly receiving AAAA records, you can use the hostname ipv6.google.com as a generic test. *Note: Google properties will not return AAAA records for all users. Please see the Google over IPv6 page for more information about whether your system qualifies. If you are not able to get a successful result, this means that there is most likely a problem with the server you are trying to contact. Wait some time and try running the tests again. This may be a temporary problem on the server’s side that will likely resolve itself eventually. If it does not, you should contact the owner of the server. If you do get a successful result, there may be a problem with Google Public DNS. Please include the output of this command and the one from step 2 in any communication with the Google Public DNS team. Most of the time, your ISP automatically assigns a primary and secondary DNS server when your router or computer requests network information via DHCP. But what if those ISP-provided DNS servers aren’t reliable or you’re troubleshooting an issue and you suspect that DNS might not be working properly? The Domain Name System (DNS) is a database that handles translating a fully qualified domain name into an Internet Protocol (IP) address. Most computer networks will have at a minimum one DNS server to handle queries which are commonly referred to as the “name server.” It will store a listing of all of the IP addresses stored on the network as well as a cache of the IP addresses recently accessed outside of the network. On any given network, a computer only needs to know the location of one name server. When a computer goes to lookup an IP address that is not stored on the computer, it will check with the Name Server. The Name Server will see if it is addressed locally, but if someone on the network has recently requested the same address the IP address will be retrieved from the server’s cache. Each of these cases results in little wait for a response. If the address has not been requested recently, then the Name Server will perform a search by querying two or more name servers. These queries can take anywhere from seconds to a minute based on the network speed. If no resolution is found, an error message is returned to the user. The following are public DNS servers available for free use at the time of this writing. Before changing your personal or work computer DNS settings, ensure that you note the specifics for the legacy system you are changing in the event the free service has issues or is no longer available. Norton provides three DNS servers based on types of security provided. All policies block malware, phishing and scam sites. Non-Family Friendly (for families with children) includes sites that feature: mature content, abortion, alcohol, crime, cult, drugs, gambling, hate, sexual orientation, suicide, tobacco or violence. SecureDNS helps users keep safe online with its malware domain filtering feature. SecureDNS references a real-time block list (RBL) of harmful websites (i.e. phishing sites, malware sites, spyware sites, and parked domains that may contain excessive advertising including pop-up and/or pop-under advertisements, etc.) and will warn you whenever you attempt to access a site containing potentially threatening content. I have to admit Google DNS servers are fastest among public DNS servers.